Be the first to share your favorite memory, photo or story of Brian. This memorial page is dedicated for family, friends and future generations to celebrate the life of their loved one. 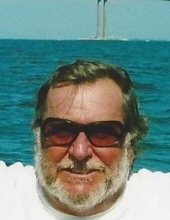 Snyder, Brian Alan - Age 73, of Grand Blanc, died October 18, 2018. A memorial gathering will begin at 2 PM Saturday, November 10 at the Lake Park Village Clubhouse, 9414 Lake Park Drive, Grand Blanc. It will conclude at 5 PM. Arrangements are being handled by Sharp Funeral Home & Cremation Center 6063 Fenton Rd. Flint. Those desiring may make contributions to the Food Bank of Eastern Michigan or the Old Newsboys. Brian was born March 16, 1945 in Big Rapids the son of Homer and Grace (Wahlgren) Snyder. He married Deborah McCollum in Grand Blanc on December 20, 1993. Brian retired from GM Metal Fabricating. He is survived by his wife, Debbie; daughter, Tania Snyder (Loren Kooier); step-children, Jeff (Lisa) Goward, Carrie (Sean) Struble, Stefanie (Tom) Jones; grandchildren, Casey, Drew, Logan, McKenzie, Hogan, Brandon, Emma, Abby, Kaylee; brother, Larry (Kay) Snyder; 2 nephews, Steve Snyder and Brian Snyder. Brian was preceded in death by his parents. Tributes may be shared on the obituaries page of www.sharpfuneralhomes.com. To send flowers or a remembrance gift to the family of Brian Alan Snyder, please visit our Tribute Store. "Email Address" would like to share the life celebration of Brian Alan Snyder. Click on the "link" to go to share a favorite memory or leave a condolence message for the family.